As an Internet marketing manager I use hypothesis testing all the time. There are quite a few great marketing uses of the hypothesis test with Excel that I will explain in detail in future articles of this blog. If you would like to see one very useful application of the hypothesis test in an article in this blog, check out this blog article on how to construct a split-tester in Excel that is better than the Google Website Optimizer. The basic test of this split-tester (and the Google Website Optimizer) is a hypothesis test. In a nutshell, a hypothesis test is used to determine if something really has changed. For example, maybe you changed your Intenet marketing program slightly and you want to determine within 95% certainty whether the sales results that you've noticed are caused by your changes or are they just the result of random chance. The hypothesis test is the perfect tool to quickly answer that question. I will go so far as to say that the hypothesis test is my favorite Internet marketing statistical tool. Right now I would like to present a 4-step framework that can be used to solve ALL hypothesis tests. To my knowledge, I have not seen this framework presented anywhere else, but it definitely works for every type of hypothesis test. • Proportion test samples have only two possible outcomes. • Mean test samples have multiple possible outcomes. • Two-tailed tests determine whether two means are merely different. • Two samples are taken if no comparison data is available. performed on paired data - Proportion testing cannot. • Unpaired data testing is performed on data collected in groups. This is the most important distinction that must be made. Mean testing and proportion are both solved using the same 4-step method but use different formulas. Mean testing – Hypothesis tests of mean use samples that can taken a range of values. For example, you are testing to determine if sales have gone up over the course of a month. The sampled daily sales can have a wide range of values. Proportion testing – Hypothesis test of proportion use samples that can have only 2 values. For example, you are testing to determine whether new keywords in a Google AdWords ad group have increased conversion rate. You are sampling whether or not a click converted. Your sample has only 2 possible values. The click either converted or it didn’t. – This depends upon whether you are using the hypothesis test to determine whether the mean or proportion of one sampled group is merely different that the mean or proportion of another sampled group, or whether it is specifically different in one direction – whether it is larger or smaller. One-tailed test – You are testing to determine if the mean or proportion of one sampled group is different in one specific direction than the mean or proportion of the other sampled group. Two-tailed test – You only want to know if the mean or proportion of one group is different than that of the other group, but aren’t testing for direction. – Whether you need to take one sample or two samples depends on whether you need have original or “before” sample data available. Two-sample testing is performed if no “before” data is available, or if no data is available on either side. Paired data testing – An example of this would be “before” and “after” testing of the same object. For example, you are measuring whether sales really went up. Paired data testing can only be performed for a hypothesis test of mean, not proportion. Unpaired data samples – Groups of unpaired data testing are treated independently of each other. – Most hypothesis tests use unpaired data. Whether data is paired or unpaired depends on whether both samples were collected from the same objects or not. - Showing the Distribution of the Variable Used by the Null Hypothesis. – The Area Under the Normal Curve That Corresponds With the Degree of Certainty You Require For Your Hypothesis Test. Without going into too much detail, we will take a brief look at solving a hypothesis test using the 4-step method. Problem: A furniture company states that its average delivery time is 15 days with a (population) standard deviation of 4 days. A random sample of 50 deliveries showed an average delivery time of 17 days. Determine within 98% certainty (0.02 significance level) whether delivery time has increased. We know that this is a test of mean and not proportion because each individual sample taken can have a wide range of values: Any delivery time sample measurement from 12 to 18 days is probably reasonable. We know that this is a one-tailed test because we are trying to determine if the "After Data" mean delivery time is larger than the "Before Data" mean delivery time, not whether the mean delivery times are merely different. We know that only one sample needs to be taken because the population data being tested is already available. The Null Hypothesis normally states that both means are the same. We now create a Normal curve showing a distribution of the same variable that is used by the Null Hypothesis, which is xavg. The mean of this Normal curve will occur at the same value of the distributed variable as stated in the Null Hypothesis. Since the Null Hypothesis states that xavg = 15, the Normal curve will map the distribution of the variable xavg with a mean of xavg = 15. The problem requires a 98% Level of Certainty so the Region of Certainty will contain 98% of the area under the Normal curve. We know that this problem uses a one-tailed test with the Region of Uncertainty entirely contained in the outer right tail. 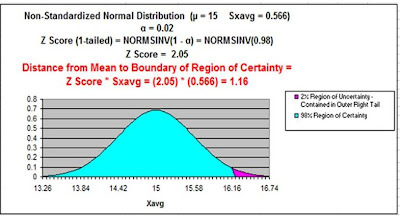 The Region of Uncertainty contains 2% of the total area under the Normal curve. The entire 98% Region of Certainty lies to the left of the 2% Region of Uncertainty, which is entirely contained in the outer right tail. Excel Note - NORMSINV(x) = The number of standard errors from the Normal curve mean to a point right of the Normal curve mean at which x percent of the area under the Normal curve will be to the left of that point. Additional note - For a one-tailed test, NORMSINV(x) can be used to calculate the number of standard errors from the Normal curve mean to the boundary of the Region of Certainty whether it is in the left or the right tail. The Region of Certainty extends to the right of the Normal curve mean of xavg = 15 by 2.05 standard errors. 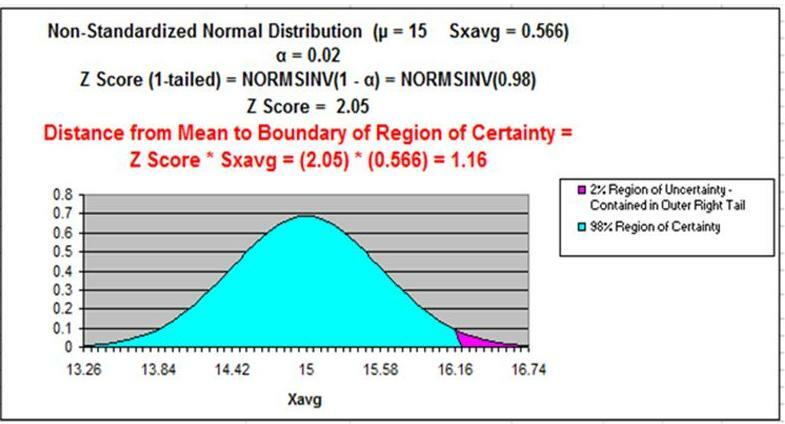 This point, 16.16, is the right boundary of the 98% Region of Certainty on the Normal curve. The Critical Value Test is the final test to determine whether to reject or not reject the Null Hypothesis. The p Value Test, described later, is an equivalent alternative to the Critical Value Test. The Critical Value test tells whether the value of the actual variable, xavg, falls inside or outside of the Critical Value, which is the boundary between the Region of Certainty and the Region of Uncertainty. If the actual value of the distributed variable, xavg, falls within the Region of Certainty, the Null Hypothesis is not rejected. If the actual value of the distributed variable, xavg, falls outside of the Region of Certainty and, therefore, into the Region of Uncertainty, the Null Hypothesis is rejected and the Alternate Hypothesis is accepted. The actual value of the variable xavg = 17 and is therefore to the right of (outside of) the outer right Critical Value (16.16), which is the boundary between the Regions of Certainty and Uncertainty in the right tail. 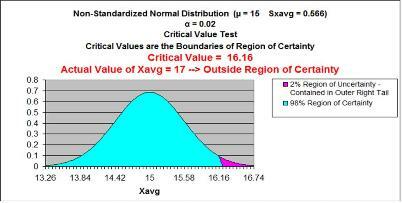 The actual value of the variable xavg is outside the Region of Certainty and therefore outside the Critical Value. The p Value Test is an equivalent alternative to the Critical Value Test and also tells whether to reject or not reject the Null Hypothesis. The p Value equals the percentage of area under the Normal curve that is in the tail outside of the actual value of the variable xavg. For a one-tailed test, if the p Value is larger than α, the Null Hypothesis is not rejected. For a two-tailed test, if the p Value is larger than α/2, the Null Hypothesis is not rejected. For a one-tailed test, the Region of Uncertainty is contained entirely in one tail. Therefore the curve area contained by the Region of Uncertainty in that tail equals α. For a two-tailed test, the Region of Uncertainty is split between both tails. Therefore the curve area contained by the Region of Uncertainty in that tail equals α/2. Excel note - NORMSDIST(x) calculates the total area under the Normal curve to the left of the point that is x standard errors to the right of the Normal curve mean. The p Value (0.0002) is less than α (0.02), so the Null Hypothesis is rejected and the Alternate Hypothesis is accepted..
For a one-tailed test---> When the p Value is less than α, the actual value of the distributed variable falls outside the Region of Certainty and the Null Hypothesis is rejected. Excel Statistical Master go into a lot of detail with many examples of doing every type of hypothesis test in Excel. Feel free to comment on this blog article. Your opinion is very important.